NiCK'S SANCTUARY: Is It Safe? Well it's time for my bi-annual scare. No sleeping in for me! 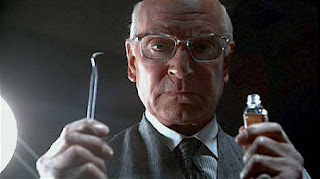 Come 10:45 AM I have to be at that place that induces primal fear in all of us - the dentist! When they do X Rays, they say it's perfectly safe... then set the timer and run as fast as they can out of the room leaving you pinned down by a heavy sheet of lead padding! When doing any kind of treatment in your mouth, they always pump way too much water in to clear out any loose material. I swallow back so much water, I keep thinking I'm going to drown. I very rarely need anything doing... but once I missed an appointment and had to reschedule. Strangely by coincidence I apparently needed a filling. Guess they get their pound of flesh (or enamel) out of you one way or another! My dad has very rarely been to the dentist and yet has a fine set of teeth. Mum regularly goes and... well, lets just say she isn't so fortunate! My dentist doesn't like using local anaesthetic and will only freeze you up for REALLY deep fillings and stuff. So I have to sit there and take it (actually I don't mind that so much, it's the only time I get to act like a hard man). The one occasion that the dentist DID use anaesthetic, it was completely ineffective and I had to be given more than the required dosage. Unfortunately, it then had triple the effect effect and I couldn't feel most of my mouth... or my tongue! Every time I sit in the chair, I feel like Captain Kirk! I end up grabbing the armrests and holding on for dear life as the dentist decides to probe my mouth with his tools and go on a 5 minute mission to explore strange new worlds, to seek out new life and new civilizations, to boldly go where no one has gone before. I'm starting to think my Dad's got the right idea. Funny man my Dad (sometimes unintentionally). Conscious that everyone in my family except me wears glasses, I decided to try and gauge how long I had before it became likely I'd need them. I asked Mum when she first started to need glasses... and she told me it was in her early teens - just like my sister. So I asked my Dad when his eyesight began to deteriorate... and he told me "Ooh it was about the same time I married your Mum!" Class line and he didn't even register what he himself said. Excellent. So please pray for me as I step through the dreaded portal tomorrow. I think my X Ray's are due, so I will probably glow in the dark for a week! Well that went relatively well, no damage as usual... X Rays are next time so I'm not going to be a nightlight for now!